A five- to fifteen-minute classroom conversation around purposefully crafted computation problems that are solved mentally. The best part of a teacher’s day. how to develop grade-level-specific strategies for the operations of addition, subtraction, multiplication, and division. Number Talks supports the Common Core State Standards for Mathematics. While the book may be used as an independent resource, it is also structured to provide a framework for collaborative learning groups or to provide professional development opportunities through grade-level teams, individual schools, or districts. Chapter 9 serves as a facilitator’s resource. The online video clips provide a visual platform for teachers to reflect on their current practices and target essential understandings from their readings. 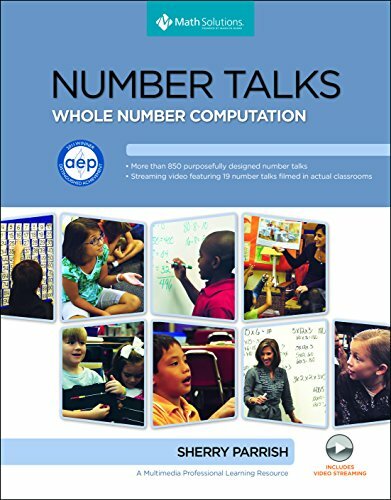 The video clips feature number talks filmed in actual classrooms, grades K, 2, 3, and 5, plus seven bonus tracks highlighting interviews with the author and teachers. Clips range from five to ten minutes in length with a total viewing time of approximately two hours. The resource includes reference tables to help you quickly and easily locate the video clips by chapter and grade level. All video clips can be viewed online using the key code found on page xxii. To learn more about video streaming access, visit mathsolutions.com/myvideos. More than 250 pages of user-friendly reproducible dot images and ten frames for grades K–2 from Chapter 4. Reproducibles are sold separately. To learn more, visit mathsolutions.com.